Producing a movie like Doctor Strange or any other flick that depicts fantasy worlds requires much more than just a powerful compositing software because the footage you're editing needs to be recorded in front of a green screen. Green screen backdrops allow you to change the background of the shot and use virtually any background you want instead. The good news is that you no longer need astronomical budgets to use the Chroma Key effects in your movies, YouTube videos or live streams since green screen kits and backdrops are available at more than reasonable prices. If you are looking for a green screen backdrop you can use on your set, you've come to the right place, because in this article we are going to take you through the ten best green screen backdrops and kits in 2019. So, let's get started. Besides shooting a green screen video footage with the green screen background drops, you can also find some resources for green screen footage and green screen backgrounds. To compositing a green screen video, you may need a green screen video editor. Check our picks of the best free green screen software. 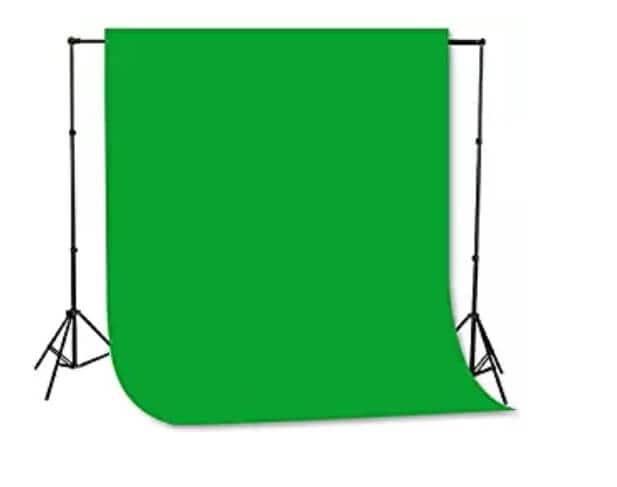 During the production process, while filming the scenes in front of a green screen, the size of the screen can prove to be essential, especially if the scene you're recording contains a lot of on-screen action. That's why Elgato Collapsible is one of the best Chroma Key panels on the market, as it offers more than enough room for your actors to move. The screen is wrinkle-resistant and it is equipped with the pneumatic X-Frame that automatically locks the screen in the selected position. To make things even better, Elgato Collapsible is optimized for camera chroma keying. Besides green screen, Elgato also provides some of the best capture cards. Check our picks of the Best Elgato Capture cards in 2019. 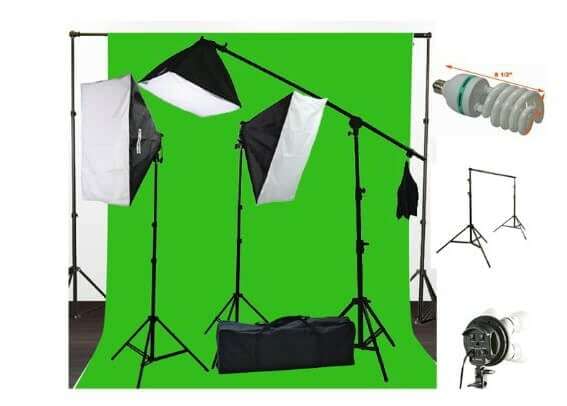 Video content creators who shoot most of their footage in studio conditions are going to love using this green screen and lighting kit. 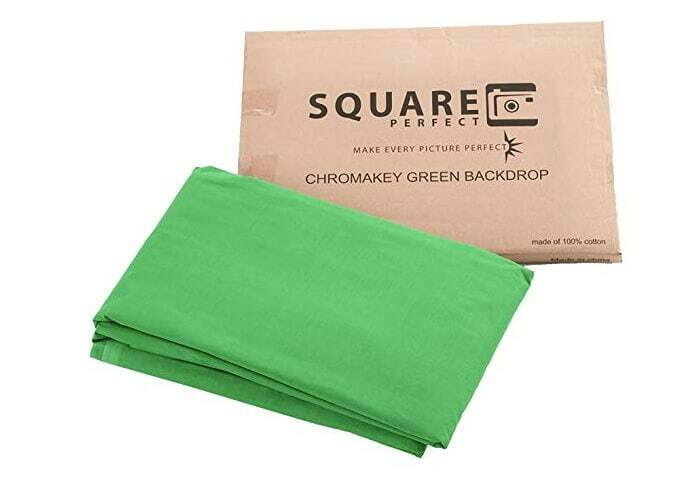 ePhoto Muslin Green Screen background comes with a stand that enables you to easily set it up. The kit also contains three softboxes that utilize daylight studio light bulbs. You can easily switch off the lights while you're not shooting, although you can't reduce their brightness. The size of the green screen could be bigger, but it is large enough to meet the demands of broadcasters and other online video content producers. 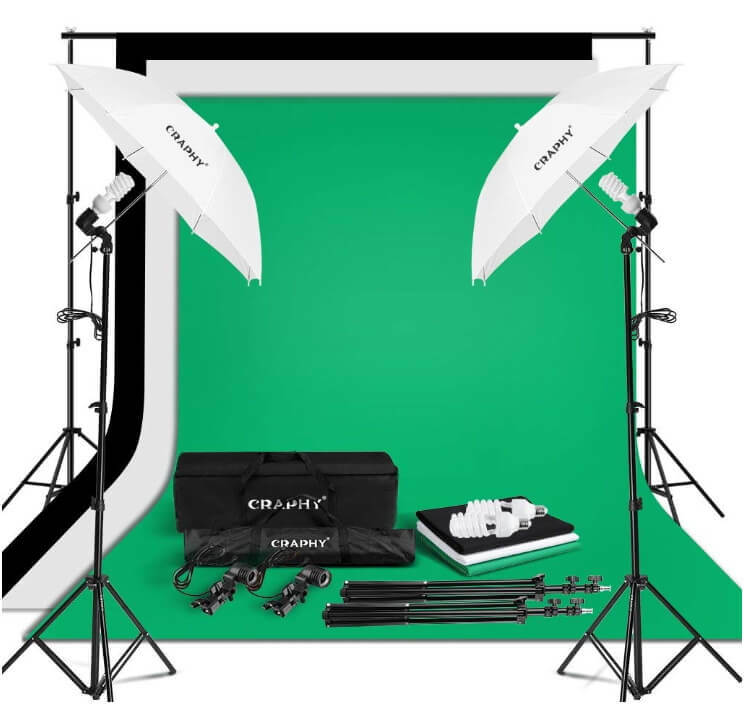 This kit includes green, black and white backgrounds, so besides shooting green screen videos, you can also create perfect studio portraits or high-quality product shots. A backdrop support stand with a crossbar, 3 backdrop support clamps, and 5 backdrop holders are also included in the kit, which means that you just have to choose where to place the backdrop and start shooting. Two umbrella reflectors and 2 softbox lighting diffusers are going to make sure that the light in your shots is always perfect. All the components in the kit are made from sturdy materials and are surprisingly lightweight. Professional and amateur video creators often need a green screen they can easily adjust to the demands of the video they are working on. The aluminum tripods and the support bars enable you to easily change the height of the background support system so it can fit the scene you're shooting. 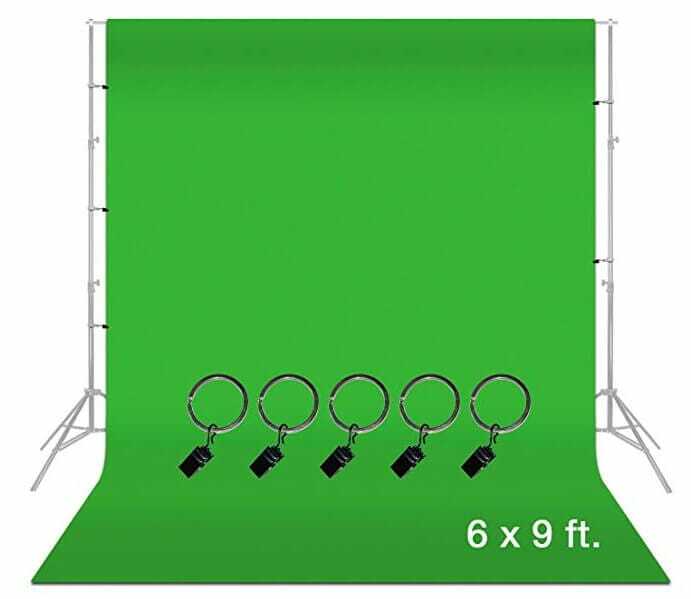 The 6x9 feet muslin green screen background is perfectly suited for gaming videos and many different types of YouTube videos that utilize the Chroma Key effect. The Fancierstuido Green Screen Background can be used equally effectively on the exterior and interior locations. Even though this is a photography kit, it can also be used to create the Chroma Key effect in videos that don't involve a lot of on-screen action. As its name suggests Craphy PhotoStudio Umbrella Lighting Kit features two translucent 33-inch white umbrellas, two bulb holders as well as two photo studio light stands. The kit also includes three cotton backdrops that come in white, black and green colors. Each backdrop is 6X9 inches, which makes them perfect for studio photography or videos that have only a few characters. The backdrop holders are collapsible so you can adjust them in accordance with the demands of the project you're working on. 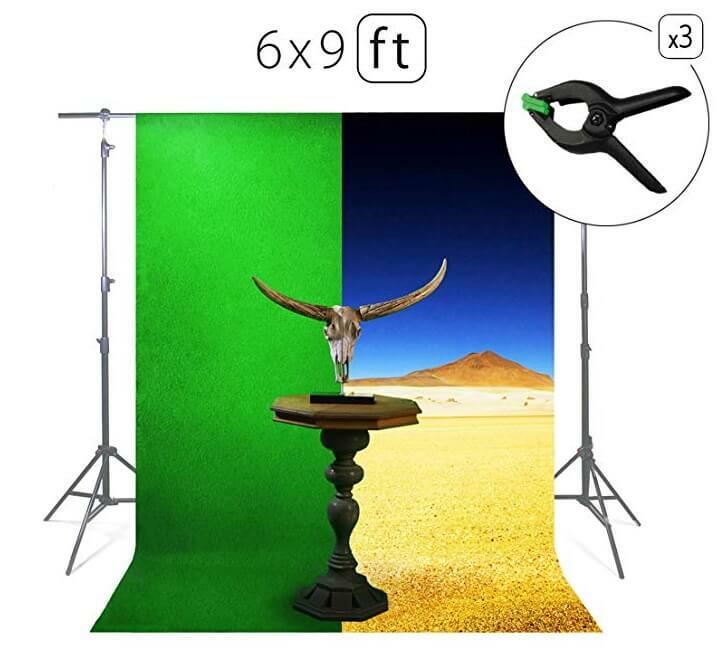 Setting up the SquarePerfect 4037 Professional green screen backdrop is easy since all you have to do is place it on the support. However, the backdrop support stand is not included in the offer. This green screen backdrop is an ideal solution for all sorts of online videos that rely on the Chroma Key effect because of its size, that allows for a medium amount of movement in the shot. Rod pockets keep the backdrop steady and stretched so you can focus on what is going on in the shot. 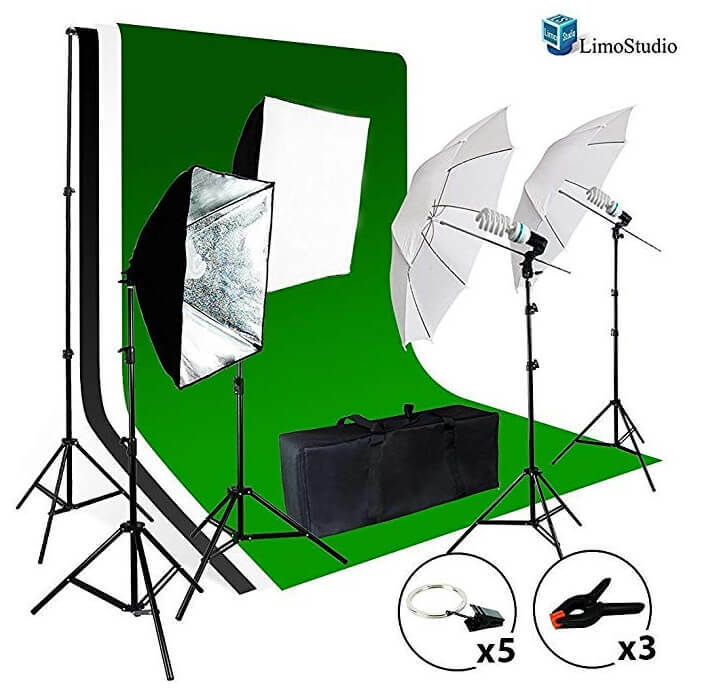 LimoStudio Green Muslin Backdrop is a perfect option for anyone who already has all the necessary equipment for production of Chroma Key videos. You will need a stand and a crossbar to stretch the backdrop, but if you decide to purchase LimoStudio's backdrop you will get five ring-shaped holding clips that can carry as much as 5lbs of weight. The backdrop is made entirely of polyester and its size is 6X9 feet, which makes it an excellent choice for live streaming, gaming videos or product videos. The backdrop is reflective with a non-glossy surface. If you are looking for a green screen backdrop that can be used equally effectively at home or in a professional studio, you should look no further. MUVR Lab Green Photo & Video backdrop is large enough to help you produce Chroma Key videos for your YouTube channel, live stream or epic gaming videos. However, the backdrop doesn't come with a stand, and you'll get only three heavy-duty clamps, which is why you'll need additional equipment to keep the backdrop perfectly still. MUVR Lab Green Photo & Video Backdrop has its own carrying bag so you can take it with you where ever you go. Instead of changing the background, you sometimes need to change how the people in your videos look like. 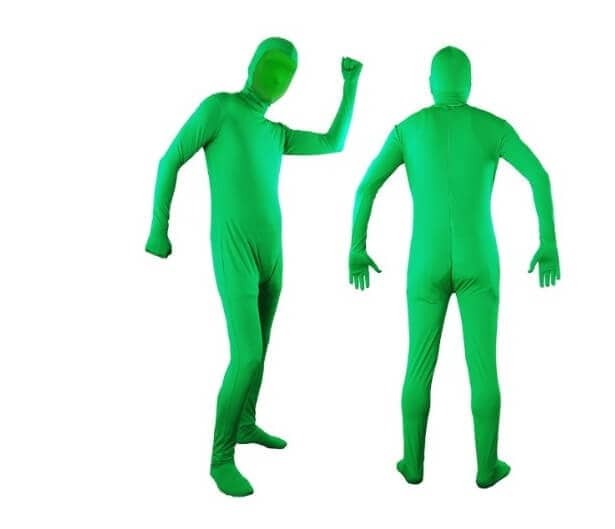 The LimoStudio Body Suit provides an affordable solution to this problem and enables you to use special effects to create any character you can imagine. The suit fits all sizes, although it can be baggy if it's worn by short people. The fabric is soft and flexible so your actors won't have trouble breathing while wearing it. Video producers in search of a simple backdrop that enables them to quickly produce Chroma Key videos should consider using the Andoer Backdrop. It is made from a single piece of cloth and it's crimped around the edges to reduce the probability of tearing. 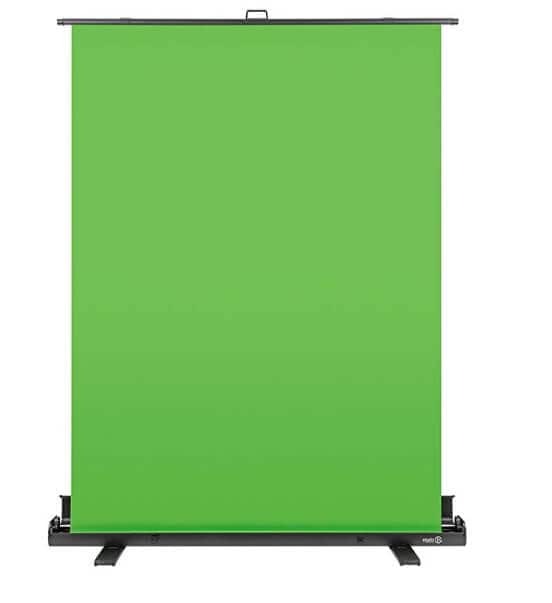 If you opt to use this backdrop you will need to make sure that you have all other equipment necessary for the production of a green screen video. The opportunities that the Chroma Key effect offers are still not fully explored, so you can use this effect to experiment with different backgrounds and to come up with unexpected results. But, before you can start editing a green screen video, you must first make sure that your footage is perfectly captured. That's why you need a backdrop or a kit that enables you to have a wrinkle-free surface and a perfectly lit set. The kits and backdrops we featured in this article are going to help you produce impeccable footage, regardless of which one you choose.